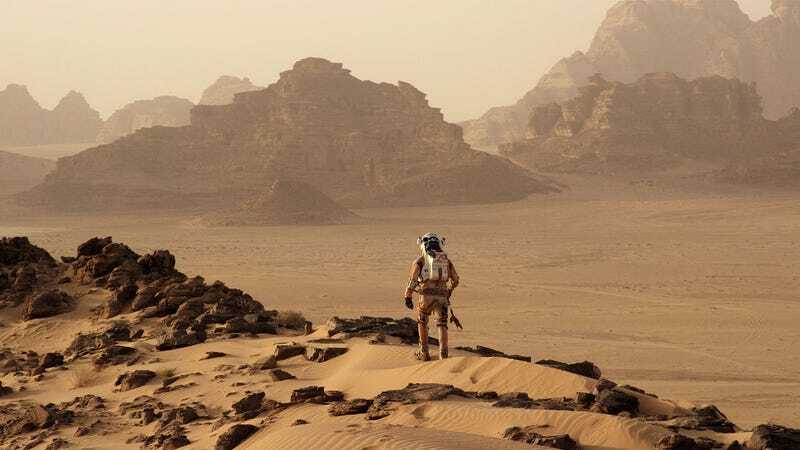 Matt Damon goes for a stroll in The Martian. Explorers hoping to find easily accessible liquid water on Mars may be out of luck. A new study questions the source of recently discovered surface water on the Red Planet, a revelation that may force Martian colonists to settle in the arctic regions where ice is plentiful. So here’s the problem: Scientists recently detected dark streaks on the Martian surface indicative of flowing water, but they have no idea where it’s a coming from. A new study published in the Journal of Geophysical Research has now ruled out the possibility that this water is slowly pouring out from melting ice deposits under the surface or from groundwater. More plausibly, this water is either coming from the atmosphere, or it may not even be water at all. Pinpointing the water source could be crucial to future Mars missions. If the dark streaks are formed by shallow aquifers seeping to the surface, future astronauts exploring Mars could theoretically use these streaks to find water that could be used as a resource, according to David Stillman, a geophysicist at Southwest Research Institute in Boulder, Colorado, who was not involved with the study. But if the streaks have a different source, liquid water on Mars might not be useful to astronauts, making mission planning much more difficult, according to Matt Chojnacki, a planetary geologist at the University of Arizona in Tucson and lead author of the new paper. Astronauts would be limited to exploring the areas around Mars’ poles, here they could melt underground ice deposits, or mission funders would have to spend additional money on fuel to bring sufficient water to Mars or the chemicals to make more, Chojnacki said. To reach these conclusions, the researchers analyzed satellite images of the dark streaks, called recurring slope lineae (RSL). 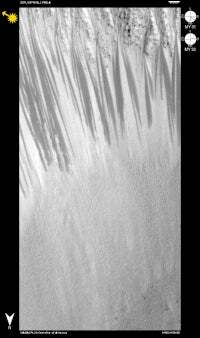 These streaks are located on canyons near the equator, an area which the scientists say is too warm to support melting ice deposits near the surface. Any ice should have have melted long ago. It’s quite possible that water exists deep below the surface, but Chojnacki says any groundwater that could cause the RSL would likely be too salty. So salty, in fact, that it would be impractical to desalinate, making it all but useless to future colonists. The researchers also speculate that the water is coming from the atmosphere, and that it’s being transferred to the ground in a process called deliquescence. Again, not very helpful for colonists unless they develop a high-tech solution to extract water vapor from the atmosphere in useful amounts (the moisture vaporators of Stars Wars’ Tatooine certainly come to mind). Even more pessimistically, the researchers say the RSL may not even be caused by liquid water at all. An effect known as “dry flows,” where small seasonal landslides trickle down the canyons, could be responsible for the transient streaks. The researchers say this is unlikely, but it can’t be ruled out. Part of the problem here is that scientists are having to rely on satellite images. Something else may be responsible for the RSL, and they may truly be caused by outflows of useful liquid water. What’s needed, therefore, are eyes on the ground. A future rover mission—or even better, a robotic plane or glider—would go a long way towards solving this mystery. The question as to whether there’s enough drinkable water on Mars, and where it’s located, is critically important to future missions and plans to colonize the planet. Ultimately, however, we may find that water will be hard to come by, and future explorers may have to be relegated to the frozen polar regions where subterranean water ice is (reasonably) accessible and plentiful.